Last year, brands dropped a whopping $10 billion on digital video ads in the U.S., and experts estimate that figure will reach $18 billion by 2020. As a strategy this makes complete sense. After all, people are spending more of their time on video-on-demand platforms, so it’s logical that the marketing dollars would follow. But research from Nielsen suggests that only a portion of this spend is reaching a relevant audience. Of the more than 30,000 people surveyed around the world, 66% said most ads in video-on-demand content are for products they don’t want. Anheuser-Busch’s Lime-A-Rita learned about the power of relevant video ads out of a business need. While brand awareness earlier this year was high, this wasn’t translating into increased brand consideration. That was until it homed in on a female audience and turned to contextual advertising—the practice of developing contextually targeted, hyper-relevant ads. The new approach drove double-digit brand favorability and purchase consideration lifts for Lime-A-Rita. Here are three contextual advertising lessons Lime-A-Rita learned along the way that other brands can apply to make their video ads more relevant and effective at scale. For your ads to be relevant, you should first get a clear view of your audience and the things they find interesting. While most beer brands heavily target men, Anheuser-Busch Senior Director of Digital Victoria Vaynberg and her team looked at the data and saw that women were more likely to buy Lime-A-Rita. “In a world where most beer brands don’t talk to women at all, we saw an opportunity to speak to them directly, and within the context of what they were already interested in,” Vaynberg explained. Once Lime-A-Rita decided to focus its marketing efforts on women, it worked toward getting a better understanding of their specific video viewing habits. Lime-A-Rita worked with Google to identify the top 50 YouTube video categories women among its target audience over-indexed on—categories such as music, recipes, and workouts. To engage with its target audience in a personalized way, Lime-A-Rita wanted to serve a different version of its ad, depending on what each woman was watching, for each of the top 50 video categories it had identified. Manually creating so much custom video content can be expensive and incredibly time consuming. For Lime-A-Rita, as for most brands working on a tight budget, that wasn’t even an option. 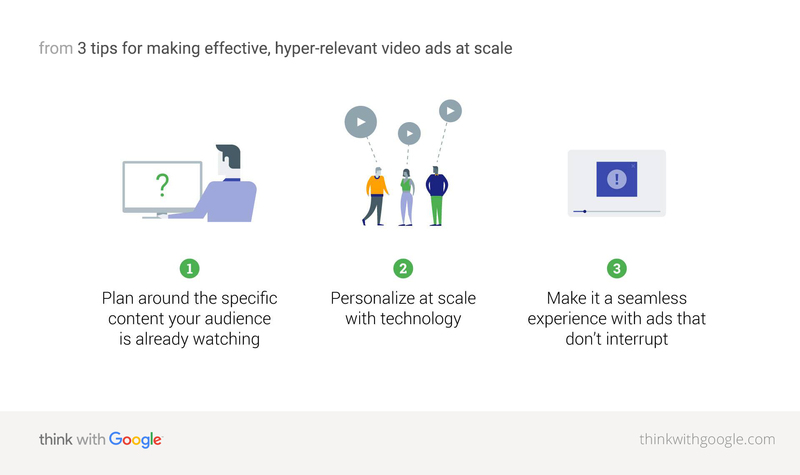 Instead, Vaynberg and her team turned to YouTube Director Mix, a new technology that mass-customizes video ads by applying individual creative elements in various combinations. Women searching for the latest Rihanna video might have seen a six-second bumper ad that resonated with music-lovers. Those looking for recipe inspiration could have been served an ad related to cooking. Earlier this year the Coalition for Better Ads surveyed 25,000 internet users to find out what makes an effective ad. Not surprisingly, the worst ads were those that people deemed intrusive—banner ads that flashed across the screen, or autoplay videos with sound. The lesson? The more your ad seamlessly blends into someone’s viewing context, the more engaging and effective it will be. That’s exactly what Lime-A-Rita found. In the spirit of seamlessness, and because Vaynberg and her team wanted to add to the viewing experience rather than disrupt it, they also opted for a shorter ad format. Shock Top Had a Commercial in the Big Game. But That Wasn't the Point.